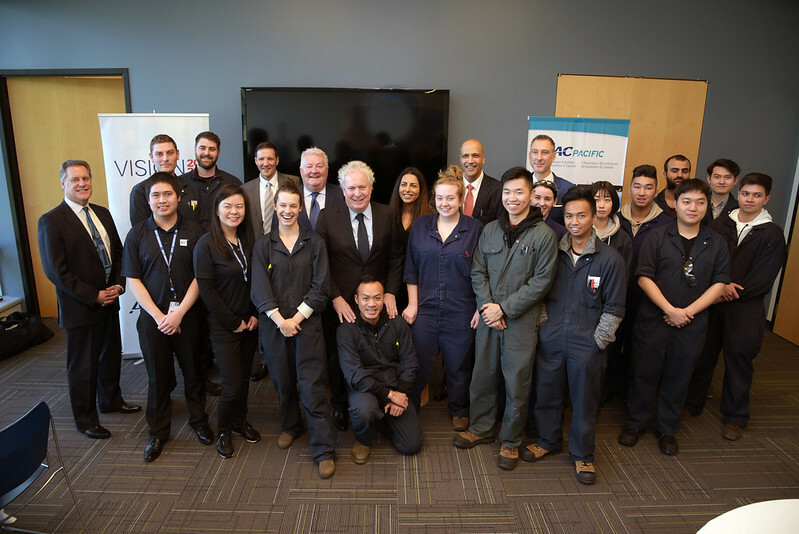 Mr. Jean Charest welcomed BCIT Aerospace students, faculty members, and industry leaders to discuss the state of the industry. The Honourable Jean Charest, former Deputy Prime Minister and Quebec Premier, visited the BCIT Aerospace Technology Campus on January 28 and addressed the risk of Canada losing its forefront in the global aerospace sector should the Canadian government not invest heavily and strategically into a long-term vision for the future of the Canadian aerospace industry. 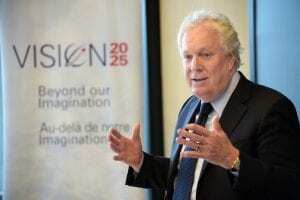 “Global competition has never been fiercer, and we’re at a turning point where Canada must step up to compete, or risk being left behind,” said Mr. Charest. Recognizing the economic and innovative importance associated with aerospace, countries like the US, France, and Germany have already strategically ramped up their investment towards the industry. As an industry that generates more than 190,000 jobs and $25 billion to the national economy each year, Canadian aerospace manufacturing also ranked among the highest in the world for total manufacturing GDP. Within the country, British Columbia is the third-largest aerospace province and alone, employs more than 9,300 skilled workers and 20,000 indirectly. Generating an annual revenue of $1.8 billion and a direct GDP of $1.63 billion, BC is also uniquely positioned to capitalize on market opportunities with its proximity to the world’s largest aerospace cluster in its neighbouring Washington State and to the rapidly growing Asia Pacific region. Despite these impressive economic prospects and our place in the global marketplace, the aerospace industry faces serious challenges. To support the vision and strategic planning of Canada’s aerospace industry, Mr. Charest and Jim Quick, President of Aerospace Industries Association of Canada (AIAC), met with Honourable Bruce Ralson, BC’s Minister of Jobs, Trade and Technology, and welcomed BCIT Aerospace students, faculty members, and industry leaders to an engagement day with roundtable discussions on the state of the industry. 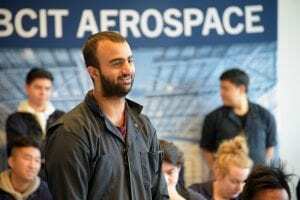 This engagement day at BCIT marks one of the five city stops for AIAC’s Vision 2025: Beyond our Imagination, an industry-led initiative to start a new dialogue between industry, government, the public, and other stakeholders that will chart a course for Canada’s future in the international aerospace sector. BCIT Aerospace students have an established proven track-record for remaining at the forefront of the aerospace industry. As part of Mr. Charest’s Vision 2025 engagement days across Canada, BCIT Aerospace students were the only cohort of students that Mr. Charest sought input from in Western Canada. The aerospace education and training offered by BCIT were also recognized by Mr. Charest to be “spectacular” and significant towards Vision 2025. 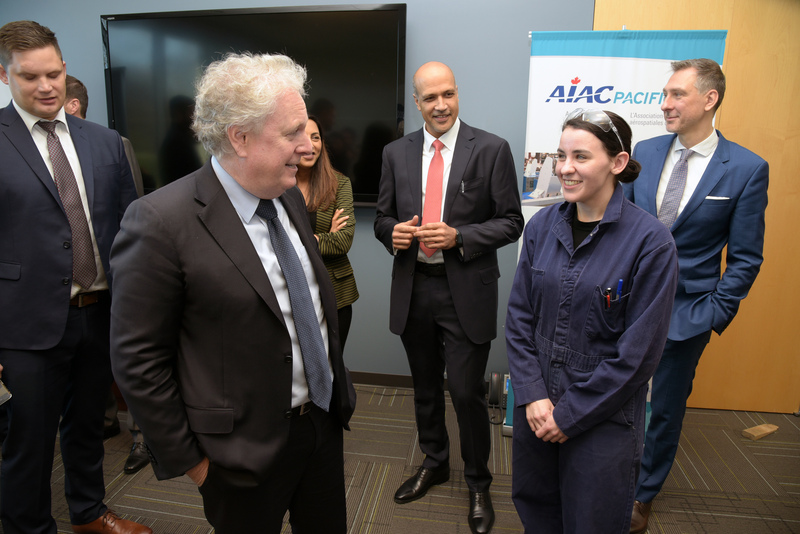 BCIT Aerospace student shared insights on the industry with Mr. Jean Charest. “It was incredibly valuable to hear the insights, expertise and opinions on how we can come together and ensure a strong, vital aerospace sector that will propel Canada’s economy now and, in the future,” shared Mr. Charest. BCIT provides the majority of trained aerospace workers in BC. In spring 2019, Vision 2025 will culminate a report with recommendations that reflect input gathered from the Charest-led discussions in cities with strong aerospace presence, and will provide recommendations to spur growth in the aerospace sector. With generational workplace shift underway, there is also a need to train and retain young aerospace workers to fulfill jobs in Canada. As BCIT provides the majority of trained workers to the aerospace industry in BC, BCIT will be working closely with government and industry to ensure that our province can fulfill the labour needed for the growing industry and good jobs are safeguarded for program graduates. Learn more about BCIT School of Transportation and Aerospace programs.